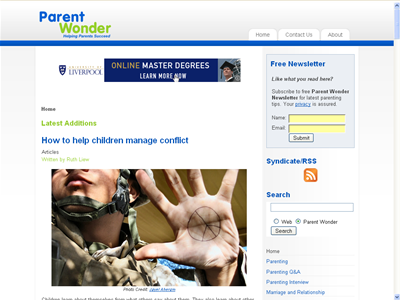 ParentWonder.com has now a new look! 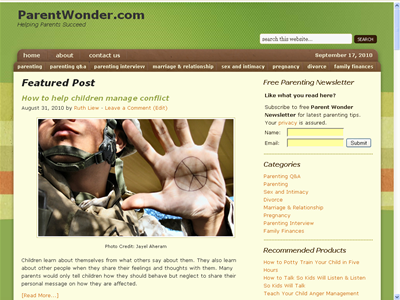 Since I have decided to migrate ParentWonder.com from Joomla to WordPress end of last month, I have been working on it for about two weeks now. imported all articles into WordPress. picked a new WordPress theme for the site. I have used the old design and platform since the site was founded three years and eight months ago. It is time for a change as I am more comfortable with WordPress than Joomla. What do you think of the new design? I hope you like it as much as I do. Note: I have not extensively checked the site yet. There are still some minor errors need to be rectified. Things like broken links, broken images, misalignment of texts (ie: the sentences end before they should end), missing pages, and so forth. If you happen to see one of the above, please email me (with the URL and type of error) and I will thank you for that. This could take a while for us to go through and make changes to the errors. Despite that, you can still browse and read the articles. I am relieved there is no major problem during and after the migration. Now where is my wine? Time to celebrate my little successful website makeover.